Thanks to Mark Perkins, former North Battleford Beaver, for the above photo of a dispute during the famous Lacombe Tournament in July, 1970. The Beavers, the defending champions, dropped a 4-3 decision to the Jamestown, North Dakota, Elks. (Ironically, the Perkin's youngest son, Joel, would go to school at Jamestown on a baseball scholarship some thirty years later !). It was about the fourth inning and I was the runner on first with one out. The batter following me, Greg Dvorak...he’s the one with the bat still in his hand as he voices his opinion to no avail...hit a soft liner towards the right fielder. I waited to see if the ball was caught before I could go to second base. To me, the baseball hit the ground in front of the outfielder’s glove and he trapped it. (The game was being televised and I found out later that several viewers had seen it that way too.) However, the first base umpire called it a catch and I was easily doubled off at first base for not tagging up, to end the inning. I pleaded my case from behind him, of course in vain. Our manager, Kenny Nelson and another player, Jim Johnston behind him straddling the line, expressed their disgust. Our catcher Lorne Bunyan tried a more diplomatic approach with the plate umpire, also in vain since that umpire claimed he was too far away from the ball to change his partner’s call. This was correct, by the way, but we certainly didn’t want to hear that then! The ‘discussion’ took a while, with the umpires finally conferring. The third base umpire wasn’t any help for us either! The original call stood. We went on to lose 4 – 3. Fortunately, nobody got tossed. Another sad day in ‘Mudville’...the batter and runner were both called ‘OUT’! There's a little guess work with trying to pin down the dates of these photos from Irl Flanagan, long time prairie diamond star. 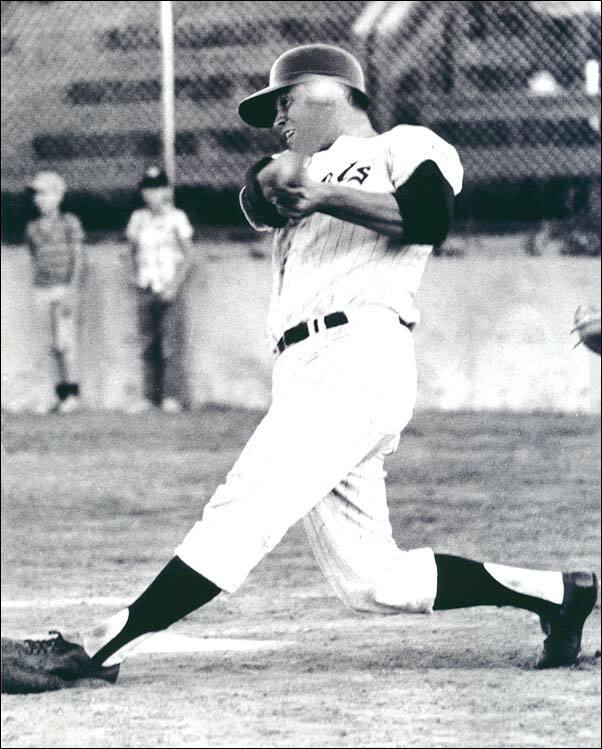 Left - North Battleford hurler Greg Dvorak, who in 1969 had perhaps the best-ever pitching mark for a summer on the prairies, 20-0, including a 12-0 mark during the regular season. 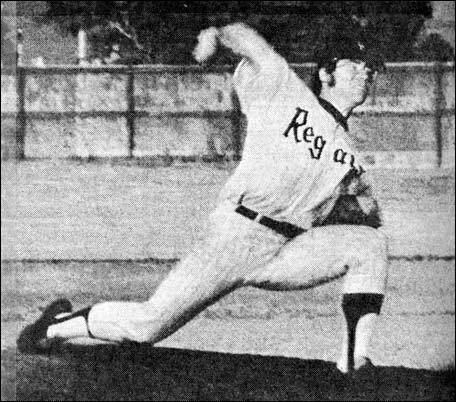 In his three seasons - 1968, 1969 and 1970 the import right-hander from Fresno State University, won 27 regular season games, losing just two. The first baseman is Mark Perkins and the base umpire is John Repin. Apparently, Dvorak had difficulty in finding a cap to fit properly, so he ended up wearing a batting helmet for the most part even when on the mound. 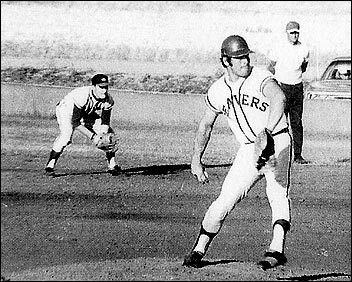 Ken Haanen of Saskatoon Commodores drills a first inning triple in a 1970 contest. 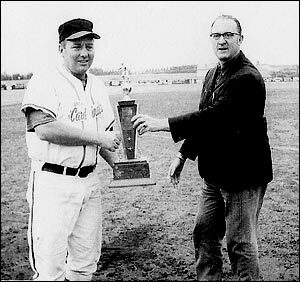 Left - Irl Flanigan, the Unity manager receiving a trophy from Eldon Elliott. Elliott was the sportscaster with radio station CJNB in North Battleford. He broadcast many of the games, kept statistics and helped each season by laying out the playing schedule. Right - Ray Leier, a Unity executive making a trophy presentation to Flanagan. 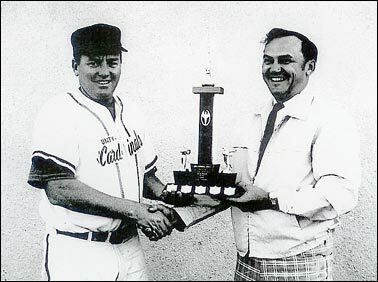 It's likely the 1970 season when the Cardinals won the Northern Saskatchewan League championship. 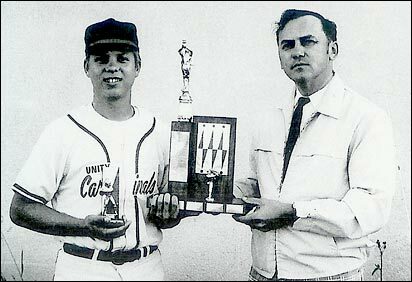 Again, Ray Leier making a trophy presentation, this time to Unity catcher Doug Wilkinson. Wilkinson appears to have begun play with the Cardinals in 1970 hitting just .239. A year later, he carried a .366 average and was second in the batting race. of the Moose Jaw Regals. The Canadian fireballer from Regina was the league's top pitcher tying for the lead in wins, with seven, and compiling the best winning percentage (.825, 7-1). He also topped the circuit with a 1.57 erarned run average. Cardwell made eight starts and had seven complete games. Below - catcher Larry Tollefson of Moose Jaw connecting for a three-run home run off Ross Stone of Melville. (July 19, 1970). 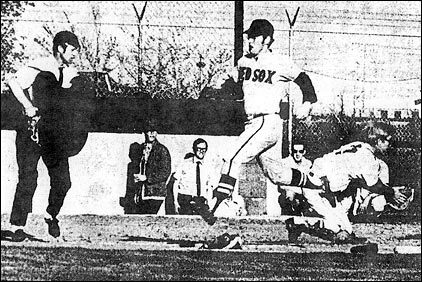 Jim Paisley of the Regina Red Sox scores his club's first run against the Yorkton Cardinals . 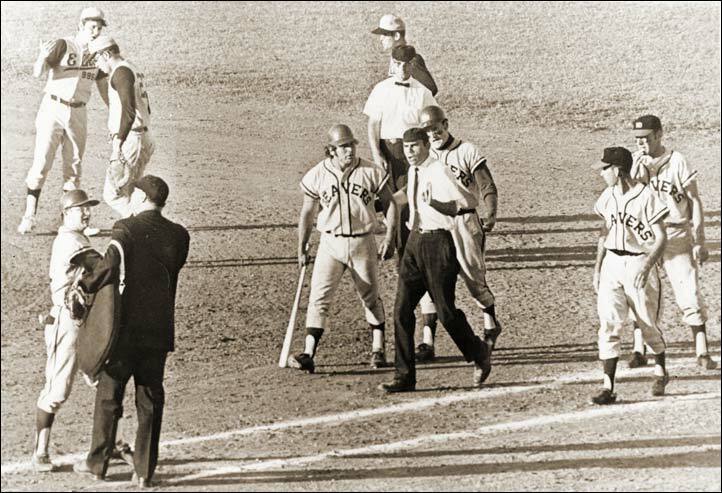 Plate umpire Owen Gillstrom looks on while the ball arrives too late for Cardinals' catcher Larry Rochholz to apply a tag. 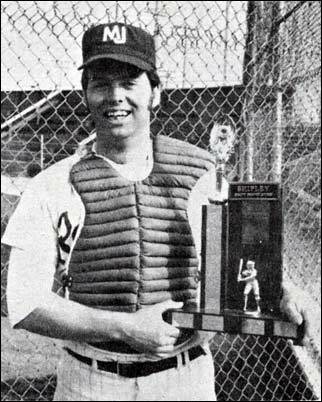 Winner of Moose Jaw's Rack-Shipley Award, catcher Larry Toillefson. The trophy is presented each year to the player showing the most hustle all season in practice and in the big games. The winner retains the trophy for one year and receives a Shipley suit of his choice. Ivan Gutfriend won in 1966.